Hartsyard is Gregory Llewellyn and Naomi Hart’s ‘urban homestead’. A restaurant with a focus on seasonal produce and nose-to-tail cooking with a focus on Southern American cuisine. Think fried chicken, biscuits (similar to British scones) and crazy desserts. It’s a little bit American and a little bit inner-west. 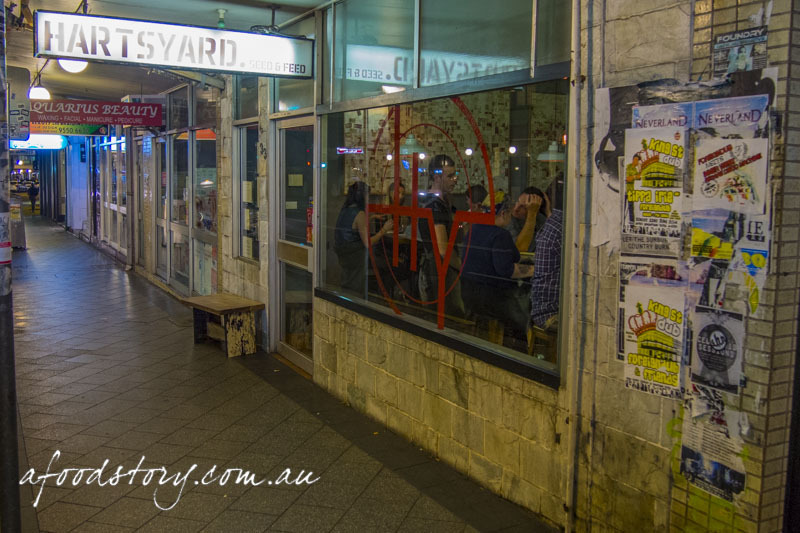 Hartsyard is one of those places I’d heard A LOT about. I’d read multiple critic and blogger reviews and been teased with sumptuous looking Instagram photos for far too long. After lunch at Mary’s and nibbles at The Stinking Bishops we set off for dinner at Hartsyard to see what all the fuss was about. School Prawn Popcorn, espelette pepper, sour cream, lemon ($16.00). Popcorn was unexpectedly… popcorn. Ok that might seem obvious now but ‘popcorn’ has appeared on so many menus in recent years and has only been tiny nuggets of food, not the real deal. So I was sort of expecting battered school prawns in some crazy form. Nevertheless the guys at Hartsyard surprised me. 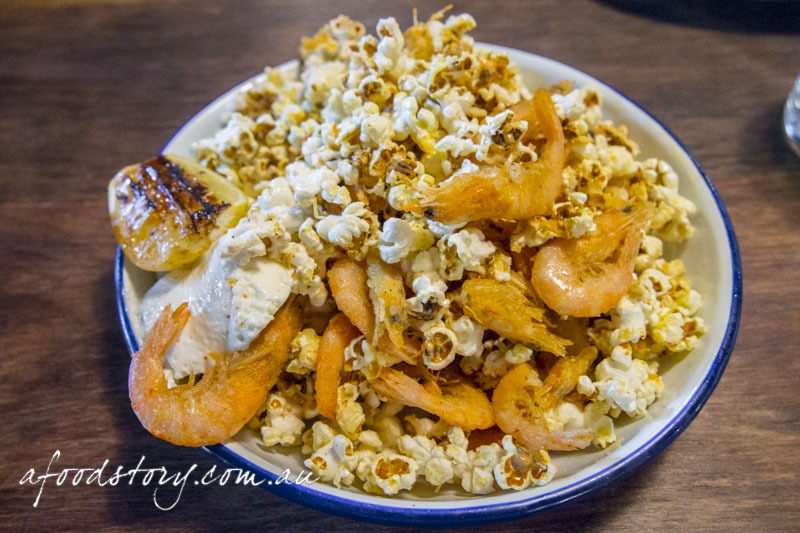 The popcorn complemented the school prawns well, the saltiness offset by a squeeze of lemon and dip in sour cream. While it wasn’t what I was expecting it was a pretty cool dish. I was impressed. Crispy Pig Tails, buttermilk dressing, pickles, hot sauce ($21.00). Next up was the crispy pig tails. 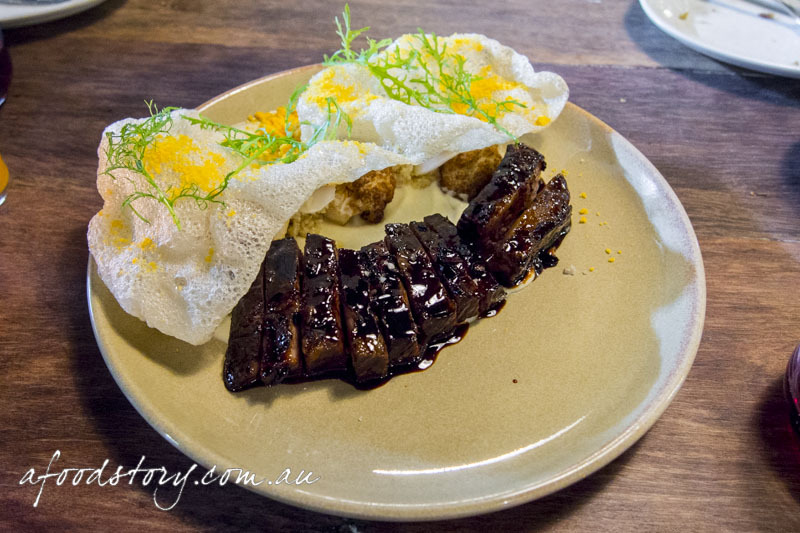 Served as two discs with a crisp outer and juicy porky centre, this dish was a little on the salty side and didn’t quite hit the spot. Accompaniments of buttermilk dressing, pickles and ‘hot sauce’ – which sadly wasn’t hot at all – paired well but couldn’t compensate the overall saltiness for me. Fried Chicken, buttermilk biscuit, low country sausage gravy ($29.00). Having asked our waiter how much to order we’d culled a main dish and were down to two – fried chicken and short rib. 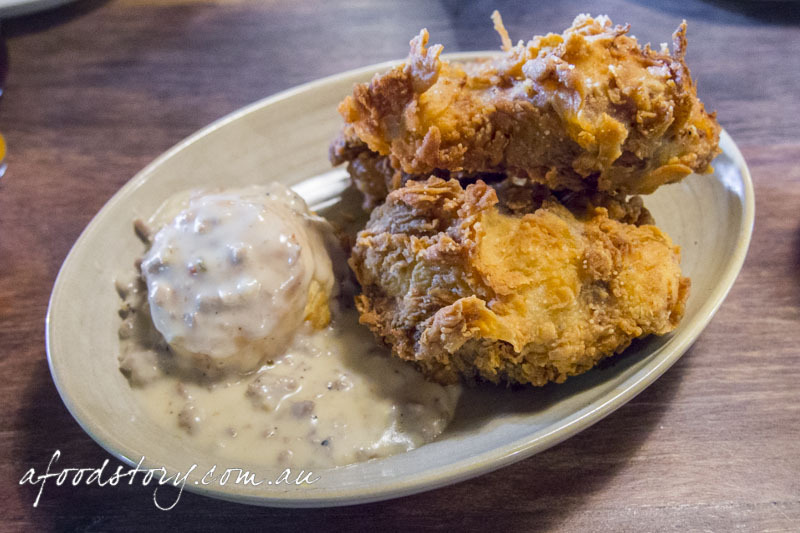 I’d heard great things about Hartsyard’s fried chicken and it was one of the dishes I’d travelled to Newtown for. Sadly, I am sorry to say, the chicken didn’t live up to the ‘best fried chicken’ hype. Yes it had a lovely golden batter which shattered at the bite, and the meat was succulent but the sausage gravy did nothing for me and I honestly felt it missed the mark (or maybe I missed the point). Short Rib, brussel sprouts, king oyster mushroom, onion, chilli ($35.00). The final main was beef short rib. I’ll be honest and admit we were all starting to feel full by this stage. We’d polished off burgers, fries and beers at Mary’s followed by cheese and wine at The Stinking Bishops. Another main was set to push us to our limits. The beef short rib smelt amazing. I knew my eyes were bigger than my tummy but those delicious wafts of beef had me ready for more. A full bodied sauce made with molasses, Tabasco and Worchestershire. It was a tasty tasty sauce and the meat was nice and tender. The tendon brought a wonderful crunch and I liked the addition of the cauliflower, cheddar and steak sauce. But we couldn’t finish it. There were precious desserts to make room for. Mint Slice, chocolate aero, mint chocolate-chip ice-cream, blueberry ($18.00). Call us crazy but after all that food we were still ready to order dessert. After all, other than the fried chicken Hartsyard’s desserts were the other thing on my hit list. The pie of the day had sold out so we opted to share the mint slice and a HY Soft Serve. The mint slice was visually stunning. 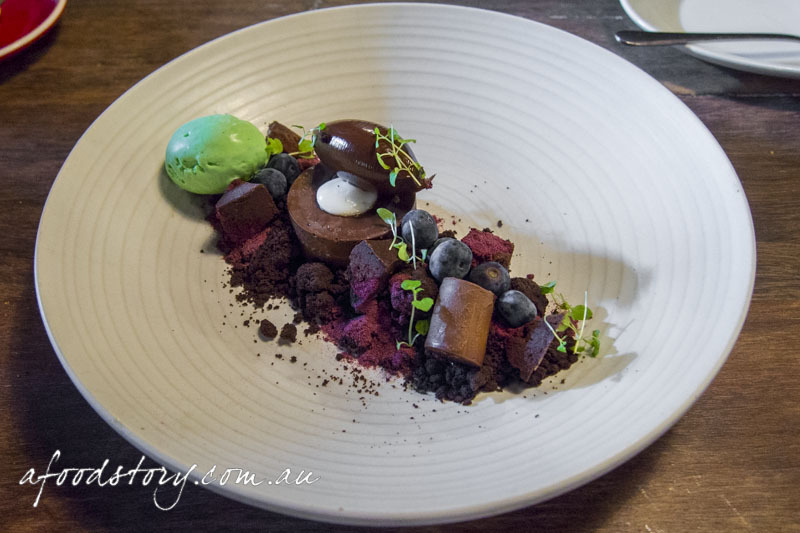 A combination of blueberry powder, blueberries, mint ice cream, baby mint leaves, and various forms of chocolate – crumb, delice, cream, ganache. Beautifully plated and wonderfully balanced. A nice nod to one of Australia’s favourite biscuits. Absolutely gorgeous. 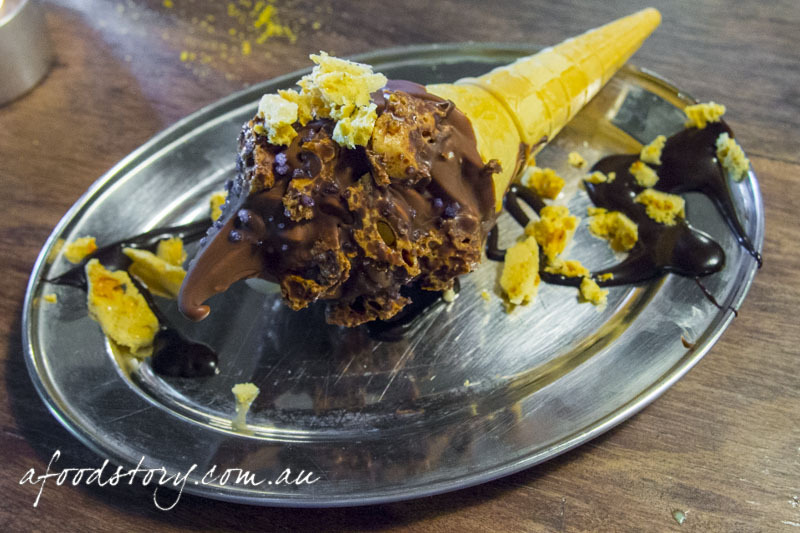 HY Soft Serve – Violet Crumble – Honeycomb soft serve, honeycomb chunks, dark chocolate dip, crystallised violets and salted chocolate fudge ($14.00). Countless HY Soft Serves have appeared in my Instagram feed over the months (years?!) and I was quite pleased the flavour combo of the week was Violet Crumble. Another little nod to an Aussie favourite. An old school wafer ice-cream cone filled with honeycomb soft serve, honeycomb chunks poking out all over the shop, dunked in rich dark chocolate and finished with pretty crystallised violets and a drizzle of salted chocolate fudge. Epic and totally worth it. Overall I found Hartsyard a little hit and miss. Perhaps my expectations of the fried chicken were far too high. But those school prawns and desserts were smashing. 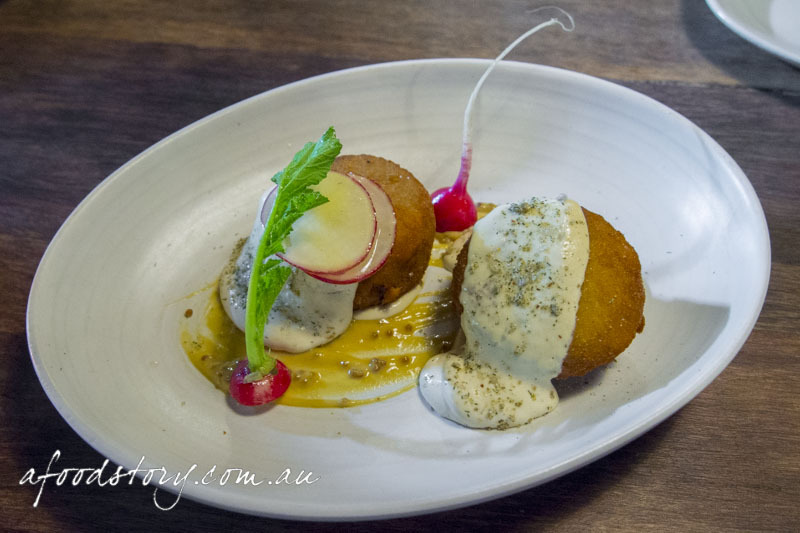 I love their philosophy and am keen to head back and try more of their menu… hopefully on a less full stomach next time.